After spending time on lakes in the woods this summer, I decided to focus more on landscapes in my upcoming series. As an artist I have used the natural world for inspiration for many of my series over the past years. As I told one of my artist friends, I am really a landscape artist. For some reason, this was a very clarifying moment for me. So what does this mean and how will it change my creative practice? I plan to focus on the geometric elements of the natural world that inspire me to help inspire others to see the beauty all around us. In my article Lakes and Forests, I wrote about two new series ideas inspired by spending time on a lake in the woods. The first series will be titled Forest with green squares and rectangles to portray the layers of a healthy biologically diverse forest with some shapes of blue for the sky glimpsing through the tree branches. The second series is Reflections inspired by the mirror reflection of the trees on the shore of the lake making a double image. This series will have greens and blues but in horizontal strips radiating out from a central horizon. As I headed up to another lake in the woods, I remembered the excitement of going up north to a lake we have visited since I was a teenager. I designed a series called Going Up North based on the great many photos I took from the passenger seat of the road in the middle with trees on either side and blue sky with clouds ahead of us. The execution of this design may be a little tricky but I always start with the vision first and then make it work. The fourth series idea is Clouds. 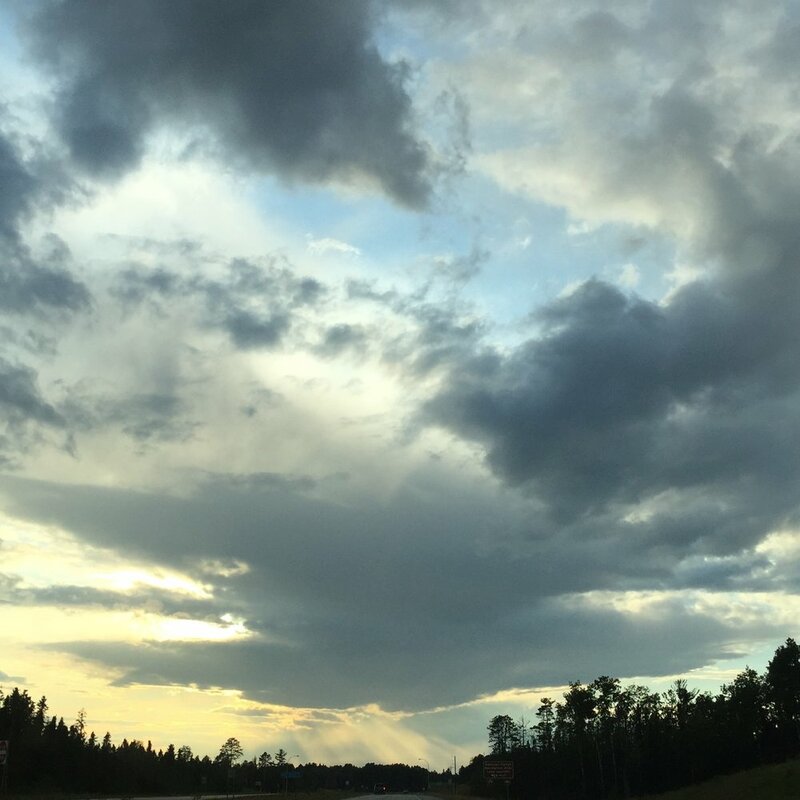 Almost every time we drive up north we see the most beautiful clouds in the sky around dusk. This part of the country has some evening thunderstorms that only last for a while. The evening sunlight angling through the large cotton ball towers of clouds for the thunderheads is striking to say the least. This will be my inspiration. Currently I envision using a similar design as the Forest construction but with greys, white, and yellows as my color palette. I want to use my art to capture that feeling of when we see the beauty of the natural world all around us. When we see this beauty and feel that connection, it enables us to see even more good in our lives that was just waiting for us to acknowledge. Every time we focus on the good in our lives, we are lead to see even more good surrounding us. My art practice feels reinvigorated after these vacation breaks to recharge. My current series Skylines has been a joy to work on in the studio. My future series ideas are providing the perfect balance of challenge and a sense of ease as I sew one strip of fabric to another building the daily 6 inch square.